Wheatgrass juice is a powerful, raw food that is got from the wheat plant. The grass of this plant has to be juiced when it is young and rich in chlorophyll. This dark, green liquid is very strong to taste but full of nutrients. Some nutritionist believe that 1 fluid ounce of wheatgrass juice can provide the equivalent health benefits of 2 ½ lbs of fresh vegetables. It is also rich in amino acids, contains 92 minerals, enzymes and vitamins. You can either get fresh wheatgrass or grow wheatgrass at home and juice it or buy any one of many wheatgrass beverages or instant juice powders available in the market. Make sure you drink only the required quantity since consuming too much can cause diarrhea and nausea. Freshly grown and cut wheatgrass must be consumed immediately for otherwise the potency reduces very quickly. Homegrown wheatgrass also has mold issues that field grown grass does not. When wheatgrass is ready to harvest (4-6 inches in height), the stalks are cut with a sharp scissors above the roots. If you decide to drink fresh wheatgrass juice, then cut the plant just before juicing. Producers of commercial wheatgrass juice use special extractors that resemble meat grinders. These are used to crush and grind wheatgrass and extract juice. After this, the juice is bottled or flash-frozen. If you prepare wheatgrass juice at home you can use a regular blender or a special wheatgrass juicer. If you are using a blender, pulverize the grass for at least one minute. Then strain using a fine cloth or filter. Many people are afraid of consuming wheatgrass juice because of the very powerful grassy taste. Apart from mixing with just water, you can create your own recipes to mask the powerful taste. Stevia (sweet herb) and agave (sweet plant syrup) are both natural sweeteners that do not contain glucose or fructose. You can use either, depending on your preference and make a delicious, tasty drink. Any citrus juice has a strong flavor and adding some like orange juice to wheatgrass juice can make a delicious drink. Fruit smoothies are excellent ways to consume wheatgrass juice. Here are some other recipes to make wheatgrass juices. Fruit smoothie: For this, you can blend ½ a banana, 1 cup frozen berries or mangoes, 1 cup water and around 2 fluid ounces of wheatgrass juice together. Add water according to the thickness you desire. Drink this smoothie fresh and cold. Easy juice using a blender: Take ½ cup of freshly cut wheatgrass (bought or homegrown). 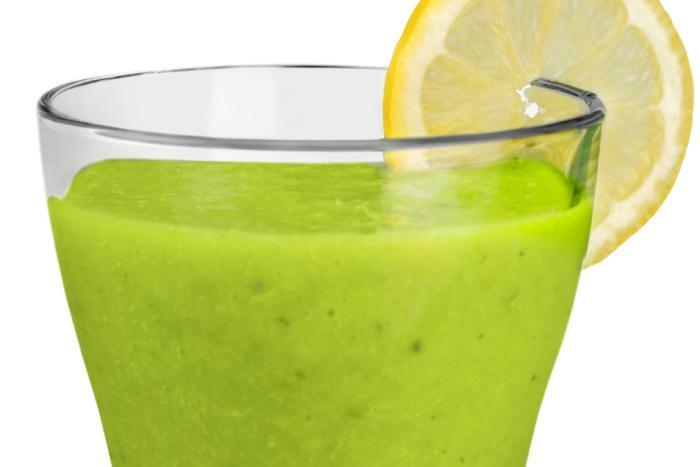 Add 2-3 cups of water and blend at high speed in a fruit or vegetable blender for at least one minute. The pulp will float to the top. Strain this juice and add some fresh lemon juice. Lemon gives a fresh, tangy flavor to the juice. Drink this economical and no-fuss juice immediately to enjoy the best benefits. Rising Sun: You can make this juice using 2 ounces of organic wheatgrass juice and 6 ounces lemonade. Solarizer: Blend 1 ounce organic wheatgrass juice and 6 ounces of carrot juice. Drink this immediately. Savory juice (green juice): This variant includes 2 oz fresh wheatgrass, 3 stalks of celery, 2 medium-sized cucumbers, fresh parsley (1/2 cup) and a few fresh spinach leaves (about 5 will do). Cut all the vegetables into small bits. Place in juicer, add required amount of water and blend well. Fruit Cocktail (Sweet Grass Special): This recipe requires 1 large orange, 2 red apples, and pinch of ground cinnamon powder, 1 oz fresh wheatgrass and 1 tsp organic honey. Once the fruits are blended well, combine the other ingredients in a pitcher. Sprinkle some cinnamon powder on top and enjoy this refreshing cocktail. Those who wish to preserve wheatgrass without juicing it can also do so. After harvesting the grass or purchasing fresh wheatgrass, pat off dirt and soil and brush with a soft clean cloth. Place the grass in airtight containers or re-sealable plastic bags and place it in the refrigerator. This can be kept for seven days. Take out the required quantity, juice it and consume it immediately. Not everyone has the time to make fresh wheatgrass everyday. Some may like to preserve it. This is where the problem lies for wheatgrass juice loses its potency quickly. So, if it must be preserved for longer than 24 hours, then freeze it by pouring into ice trays. Place the trays in re-sealable plastic bags and place in the fridge. The valuable nutrients get preserved this way since less oxygen penetrates the juice. After freezing it for four hours, you can use the cubes. 2 cubes are sufficient for each serving. Mold and bacteria are the main concerns when consuming fresh wheatgrass juice. When wheatgrass is grown indoors, mold forms since there is not much air flow. You can get harmless or harmful mold that can make you sick. Washing wheatgrass well will rid the grass of harmless mold. Similarly, un-pasteurized wheatgrass juice can harbor bacteria. To avoid this, you can buy pasteurized wheatgrass. When you buy wheatgrass, make sure it is organic and grown outdoors. Organic wheatgrass will be free from chemicals, fertilizers and pesticides. Wheatgrass grown outdoors will be relatively free of mold since there is plenty of sunshine and free airflow. The following are some of the popular brands of wheatgrass juice powders and fresh juices available. Now Foods certified organic wheatgrass juice powder has no additives, carriers or insoluble fibers. It is pure and dissolves easily in water. ALO has three brands – ‘alo AWAKEN Aloe Vera and Wheatgrass’, ‘Alo Aloe Vera and Wheatgrass Drink’ and ‘Alo Coco Exposed Wheatgrass’. They have a unique refreshing taste. The first uses cane sugar for sweetening, while the second and third have coconut juice for additional flavor. All three contain aloe vera pulp. Amazing Grass is a top brand that has several fantastic wheatgrass powders. These blend easily with fruit juices or smoothies. DynamicGreens Wheatgrass juice is made from 100% living, raw wheatgrass. The juice is flash-frozen into small cubes to preserve nutrients. The best way to enjoy the maximum health benefits from wheatgrass juice is to consume it fresh. Buy or harvest only what is required, juice it and drink immediately, observing all the required precautions. However, for those who do not have the time, there are very good reputable wheatgrass juice brands available. Some people who develop nausea due to the strong flavor of the juice can blend wheatgrass with fresh fruits and vegetables. Those who have celiac disease, wheat allergies, grass allergies or are pregnant and nursing must avoid consuming wheatgrass juice. If you have gluten intolerance, check the product label to see if it is gluten free. I just have one question. I’m planning to buy a blender but in the mean while can i user my home mixer to make wheat grass juice? Because i heard the heat produced in the mixer would kill the nutrients and stuff. Is that true?